Borough of Poole: Pure Town Planning are pleased to have recently achieved another consent for a replacement dwelling in the Poole Park Conservation Area. 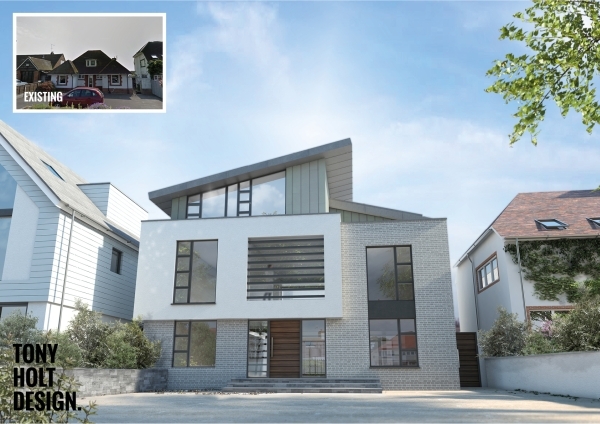 This scheme demolished an existing tired bungalow and replaced it with a state of the art, large (5 bedroom), contemporary detached family dwelling with fantastic harbour views across Poole Park. The bespoke design was prepared by architect Tony Holt Design who tailored the scale, layout and appearance of the scheme to fit with the context of the site whilst achieving the high level of floor space set out in the client’s brief. Whilst the resultant property is considerably larger than the existing bungalow on the site, with Pure Town Planning’s constant contact with the planning officer we were able to quickly convince them that the proposal was not only acceptable, but would represent an enhancement of the conservation area and street scene. If you are planning a similar “grand design”or thinking of building your own “forever home” and would like a firm of planning consultants to push your vision through the planning system to a successful conclusion, then please do not hesitate to contact us to find out how we can help you.